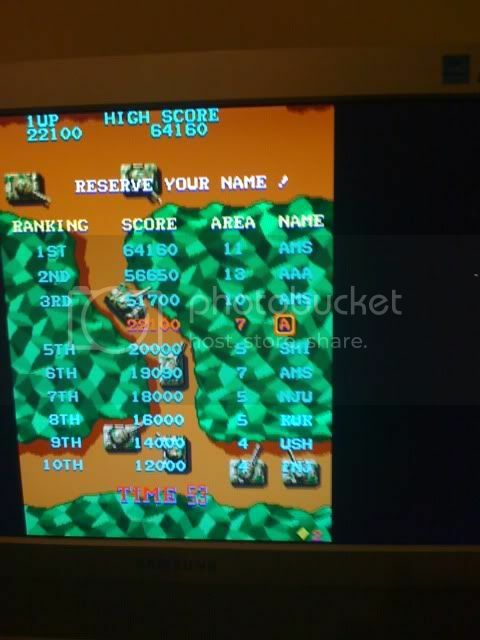 OK Tiger Heli being played through MAME. Quality game so far I got just over 70k. But will post my best score after a few more games now. Cool. Ive not played the MAME version. I will give it a try at some point later. A really tough little arcade shmup here. My best is 64,160 after about 7 attempts. I will have another go another day. We played this in the Retro League, and I got 99,510 which was 3rd from last! The best was 714,800!! I couldn't believe how hard it was, and how badly I was doing at it. Are you guys playing it on slow or fast, the majority of us in the league played it on fast. felgekarp wrote: Are you guys playing it on slow or fast, the majority of us in the league played it on fast. Please tell me how to change it to fast, it was a bit painful. When you are in the game, press Tab to get the menu up, then choose Dip Switches, then change Player Speed to Fast. I still thought it was far too slow even like that. necronom wrote: When you are in the game, press Tab to get the menu up, then choose Dip Switches, then change Player Speed to Fast. nice one. I'll try that later. That (horrible!) game is basically one tough memory test, but having said that I got about 183K the last time I played it in a comp (on fast). I can't access their site at work, but could someone post up what the Twin galaxies Dip Switch settings are?